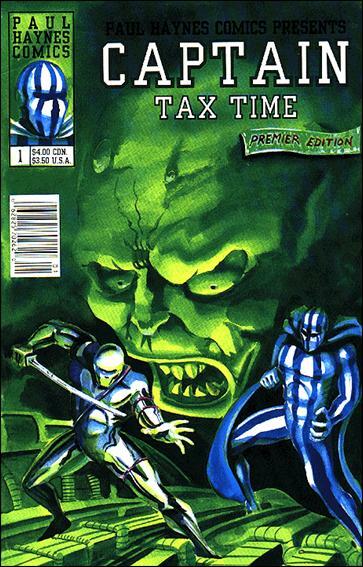 Yes, Captain Tax Time is a real thing. I stumbled across this in a Half Price Books this afternoon for 49¢ and it looked odd and quirky enough to be more than worth that price. Produced in 1990 by Paul Haynes Comics, it's a black and white comic very much in the vein of the independent comics scene of the 1980s. That is to say, it kind of looks and feels like it was done by some very talented high school students. I won't belabor the story, but it's a fairly simple tale of a finance minister who tries taxing the citizens of Canada into oblivion, whereupon Captain Tax Time and Sergeant Saver beat the snot out of him, take the money he had been earning from illegal drug dealings and donate that to the government to eliminate the deficit that the finance minister caused in the first place. I shouldn't need to say it, but there are more than a couple "Wha-huh?" moments for the reader. It turns out that Haynes and his wife Jean were the owners/proprietors of Tax Time Services Limited, a Canadian tax preparation firm. He notes in his short biography at the end of the book that the story is deliberately satirical, and one gets the sense that he knows it's not the greatest comic in the world but he had fun with it and it was a neat little side project he did when he wasn't working on taxes. The back cover (inside and out) includes an essay about taxes, with a very clear message about how one of the big problems in the Canadian tax system is that the wealthy are able to deduct their tax preparations services/fees by burying them under misleading accounting codes, whereas most people are required to pay taxes on their tax preparation services. I can see his point, but it seems kind of minor issue with regard to tax equality when, as he points out in his bio, "that wealthy people... use high priced talent to eliminate their taxes entirely..."
The last two pages of the book include ads (each featuring a four-panel comic) encouraging people to sign up for a "Personal Income tax Return Preparation Course" through Tax Time Services, apparently to become franchisees of the company. Nothing about using Tax Time Services as your own tax preparers, though, so I'm not entirely sure who this was aimed at. Particularly with the $4 CDN cover price. 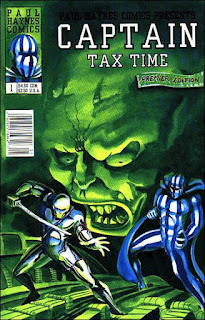 Still, an odd little snapshot of a Canadian indie comic circa 1990. It's interesting to note, too, that little extra research turns up that Tax Time Services was bought by H&R Block in 1991, although there were some legal issues that tied them up in court for five years, by which point Tax Time Services was out of business. Where Does "Marvel Comics" Come From? The Kleefeld On Comics Survey! I Like Wednesday Links In June; How About You? For The Love Of Comics!